In this uplifting talk Dr Stephanie Dowrick reminds us that we can respond to daily life and meet even the most difficult situations with hope. And with a deep sense of connection to our inner resources. Paying attention to our strengths – to what’s needed – is literally empowering in the most authentic way. This talk significantly weaves spiritual and psychological insights for our shared benefit. Enjoy this video and let it support you. You can leave your comments on Stephanie Dowrick’s Facebook page. The talk was recorded at Pitt Street Uniting Church in February 2012. 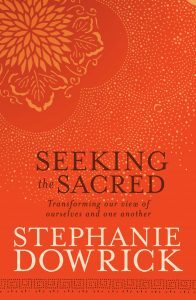 Stephanie leads a spiritually inclusive service there each 3rd Sunday of the month, at 3pm. She continues, “We can also see that even in thinking about them a kind of spiritual shyness overtakes many of us because those of us who have been raised in religious traditions are more familiar with an underlying sense of unworthiness, inadequacy, even sinfulness, than we are with contemplating the notion that we have all the strengths we need – and have only to claim them. Please share this content respectfully, checking via uhn@stephaniedowrick.com should you wish to use it for anything other than personal use.